Passion for life, passion for endurance sport and passion for teaching/coaching…best describes Coach Jim McGehee. 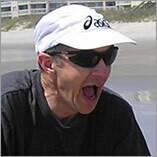 Jim is lifetime runner (his dad was a high school track coach) and long time triathlete. Since participating in his first triathlon in 1986 Jim has lived the multi-sport lifestyle spending much of his time in the active outdoors. Currently he is based in the mountains just outside of Blacksburg, VA and loves running the forest trails and riding the beautiful country roads in the area. Married for 31+ years, Jim and his wife are proud parents of 15 year old twins so you can be confident that he knows the true meaning of time management. Jim is currently accepting a limited number of athletes in order to maintain individualized, timely and friendly personal service. Check out Jim’s qualifications below and rest easy knowing that with him as your coach you will be training with purpose. Races in the Virginia Triathlon Series: Placed 3rd overall Master in 2010. 3rd in the 45-49 age group in 2008. Finished 8th overall in the Elite division in 2007. 2006 overall winner of the VTS Master's division. Jim is not just another athlete learning to coach. He is a full-time professional coach with years of experience. Let his experience and knowledge help you reach your performance potential. improve your technique, economy, training efficiency and ultimately your performance! As your coach it is my role to maximize your training response, while maintaining balance with the other important aspects of your life. Essential in the design of long-term training plan are workouts designed to improve efficiency, optimize progressive overload, allow for recovery and increase the enjoyment you have with your workouts. I believe that the use of seasonal training cycles (periodization) is critical to athletes who want to peak for specific events. However, I also feel that some element of multi-paced training is important throughout the entire training season to maintain fast-twitch muscle fibers and neuromuscular pathways. Successful coaches are good listeners, teachers, motivators and innovators. I feel that it is critical to adapt my coaching style based upon your individual needs. Each athlete is unique and performs best following a specific combination of training intensity and rest. While my coaching beliefs are founded on solid, well-documented physiological principles I am always evolving my style in ways that will best suite your personal athletic style.